Nick's Flick Picks: The Blog: V.G. News!!! That's V.G. in the Bridget Jones and also the Todd Haynes sense: I just got word that my article "'The Invention of a People': Velvet Goldmine and the Unburying of Queer Desire" has been accepted for publication in a book called The Cinema of Todd Haynes, to be published in Spring 2006 by Wallflower Press, a film-based subsidiary of Columbia University Press. 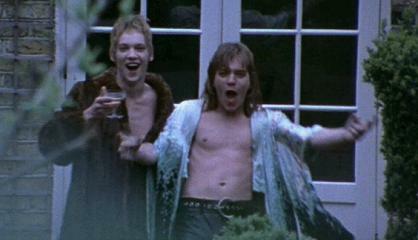 Some of you know that my dissertation chapter about Velvet Goldmine was the one dearest to my heart and also the one that met with the frostiest general reception at my dissertation defense. It's also my first print publication in the field of academic film studies. So, in my own mind, and relative to my own self-confidence about my work, to have a condensed version of that particular chapter accepted for publication is a real spirit-lifter. Thanks to everyone who left encouraging comments since yesterday... they worked! So, hey, are y'all on permanent call for this good-luck-charm hoodoo, or what?? Yay! Congrats! I cannot wait to read it, as I love academic essays, Velvet Goldmine, and Nick Davis! aaooowwww!!! well done! woo WOO!!!! "you bow to no one"
I'm dancing around my house with my pants down around my ankles, a la Ewan McGregor in VG, in a tribute to your brilliance. Aren't you impressed? Congrats, babe. The first of many, many literary successes for you!